We recommend checking out our discussion threads on the Topaz Labs LLC Topaz B&W Effects Plug-In TP-BWE-C-001-GN, which address similar problems with connecting and setting up Photo Software Topaz Labs LLC. The user manual for the Topaz Labs LLC Topaz B&W Effects Plug-In TP-BWE-C-001-GN provides necessary instructions for the proper use of the product Computers & Solutions - Software & Tutorials - Photo Software. 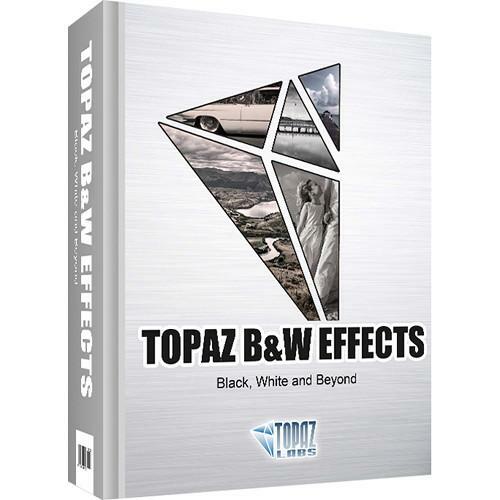 The DVD version of Topaz B&W Effects Plug-In from Topaz Labs LLC is designed to expedite and enhance the entire process of converting an image to black and white. A complete range of controls for maintaining high image quality is presented, with the ability to quickly and easily adjust the tonal and contrast ranges, apply tint colors, and utilize other process-inspired effects for simulating the look of traditional black and white photographs. The intuitively-designed interface permits the use of hundreds of different one-click effects to imagery as well as the ability to customize existing presets, or design your own, which can be saved for later use. An efficient system of adjustment sliders permit fine-tuning over chosen effects' appearances and an integrated Zone System view allows proper placement of tonal values for an expanded dynamic range. Benefitting all of the creative control offered is an enhanced processing engine, which expedites previewing and applying the effects to imagery. This plug-in is not a standalone program and requires a compatible host program for use. Compatible hosts include: Adobe Photoshop CC, Photoshop (non-CC), Photoshop Elements, Photoshop Lightroom, Apple Aperture, iPhoto, Corel PaintShop Pro, PhotoImpact, Serif PhotoPlus, Topaz photoFXlab, and IrfanView. Box Dimensions (LxWxH) 7.4 x 5.2 x 0.4"
The user manual for the Topaz Labs LLC Topaz B&W Effects Plug-In TP-BWE-C-001-GN can be downloaded in .pdf format if it did not come with your new photo software, although the seller is required to supply one. It is also quite common that customers throw out the user manual with the box, or put the CD away somewhere and then can’t find it. That’s why we and other Topaz Labs LLC users keep a unique electronic library for Topaz Labs LLC photo softwares, where you can use our link to download the user manual for the Topaz Labs LLC Topaz B&W Effects Plug-In TP-BWE-C-001-GN. The user manual lists all of the functions of the Topaz Labs LLC Topaz B&W Effects Plug-In TP-BWE-C-001-GN, all the basic and advanced features and tells you how to use the photo software. The manual also provides troubleshooting for common problems. Even greater detail is provided by the service manual, which is not typically shipped with the product, but which can often be downloaded from Topaz Labs LLC service. If you want to help expand our database, you can upload a link to this website to download a user manual or service manual, ideally in .pdf format. These pages are created by you – users of the Topaz Labs LLC Topaz B&W Effects Plug-In TP-BWE-C-001-GN. User manuals are also available on the Topaz Labs LLC website under Computers & Solutions - Software & Tutorials - Photo Software.